Four Seasons hotels are known for their excellent service and exceptional luxury — their Tented Camp Golden Triangle property certainly has those qualities. But that Four Seasons — located by the village of Chiang Saen, Thailand near the borders with Burma and Laos — also has a feature not usually associate with the chain: Elephants! Spot Cool Stuff loves the combination of animals and hotels. We’ve written before about a Kenyan hotel inundated by giraffe, a Japanese style inn where guests bathe with monkeys and an unlikely California bed and breakfast surrounded by lions and tigers. But none of those accommodations offer the pampered, high-end experience that Four Seasons does. Those who are not familiar with southeast Asia might imagine that elephants there roam wild. In fact, very few do. Unlike in Africa, elephants in Thailand are work animals. Elephants are to Thailand what water buffalo are to India, or horses are to ranching areas in the Americas. Because most elephants in Thailand are domesticated, travelers there can get a much more predictable and up-close animal experience than they could, say, while on safari in Kenya. Furthermore, travelers are instrumental to the elephants survival in southeast Asia. Historically, elephants in Thailand have worked hauling lumber down steep hills and through thick foliage. As roads and machinery are able to perform that task more economically, tourism is becoming the main reason for locals to take on the considerable effort and expense of keeping the elephants alive. 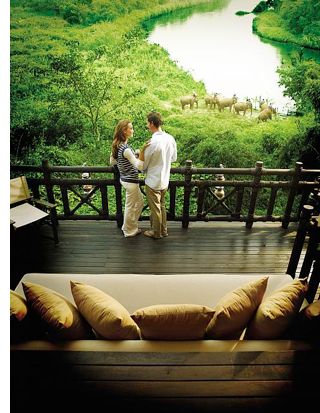 Which brings us back to the Four Seasons Tented Camp Golden Triangle. 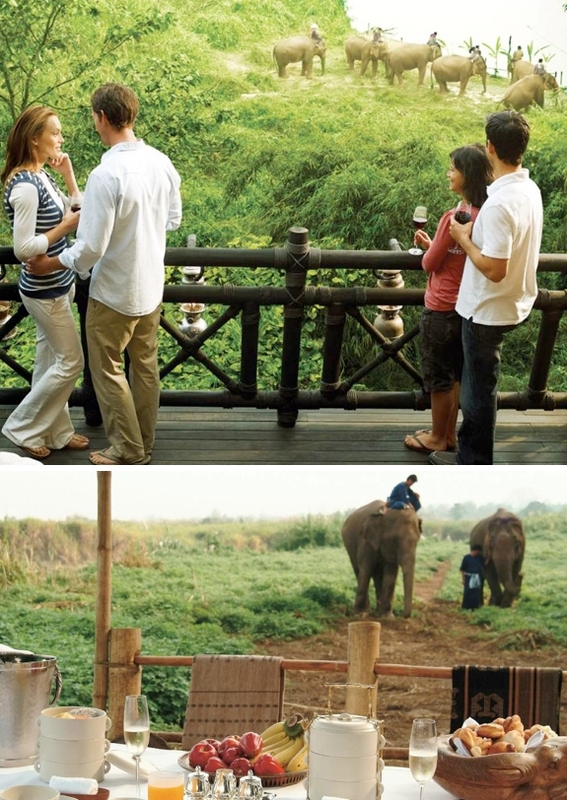 The resort, which owns a sizable tract of lush land, has adopted several elephants. Staying here you’ll encounter them whether you want to or not. You’ll see them while you eat breakfast. You’ll meet them while going for walks. You’ll hear them while waking up in the morning. • Take a jungle ride on an elephant. You’ll be taught all the basic commands and riding techniques. • Watch elders from a nearby hill tribe perform an ancient elephant ceremony. • Participate hands-on with researchers from the Golden Triangle Asian Elephant Foundation and Think Elephants International as they study elephant behavioral intelligence. • Perform a basic health check-up with an elephant veterinarian and learn more about the creatures live. 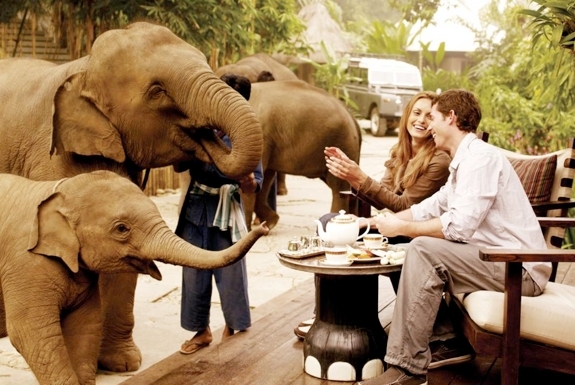 • Enjoy a private, romantic dinner in the jungle while surrounded by elephants! As for the accommodations, guests stay in 1 of 15 “tents.” We put “tents” in quotes because they bear absolutely no resemblance to anything you’d pitch at a campground. Though the structures do have cloth or thatched roofs — which, together with their jungle surroundings, makes them tent-like enough to include this review in our glamping category — each is essentially a luxury hotel suite. Each includes wifi internet, refrigerated mini bars, high-end beds with down pillows, elegant furnishings and a luxurious bath. 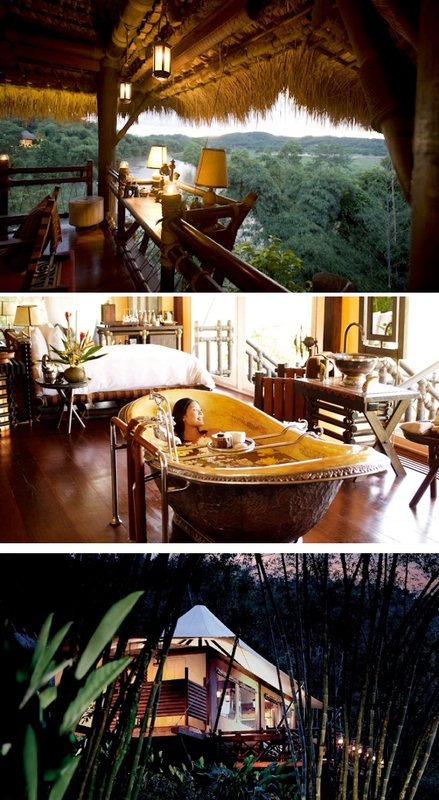 Each also has a private veranda with a jungle view across to Burma and/or Laos. 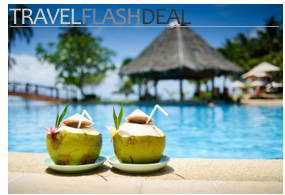 In addition, the resort has an outstanding spa, scenic pool, glorious food and a bar that’s aching to used as the location for an exotic movie. Throughout it all are little elephant touches. Water flows into the tubs through iron elephant trunks. Tables are supported by artists’ renderings of elephant legs. Wood doors are embellished with carved elephant faces. You’ll find the Four Seasons Tented Camp Golden Triangle about an hour’s drive north of Chiang Rai and four hours from Chiang Mai. Getting there, the hotel can help arrange car transportation or even a helicopter ride from the Four Seasons Chiang Mai. As for your transportation on departure — you could always ride home on an elephant.  Indeed, the species of elephant found in Asia is entirely different from the two species that live in Africa. If you go: The tents are rather spread out. Numbers 7 and 8 are arguably most convenient, equidistant between Burma Bar and Restaurant. Though all tents have amazing views, we’re partial to the scenery around tent 12. Family friendly? It is, though only children older than 12 are permitted. I love elephants and I just came back from Sri Lanka where I spent fantastic time surrounded by elephants. I felt so lucky to be able to ride one of them and feed them. Your photos are wonderful! It would actually make a great post: Best Elephant Travel Destinations. Sri Lanka would certainly be on the list. This looks utterly amazing. Must. Go!